LITTERING HAS become a concern at the Mahendra Chaudhary Zoological Park, Chhatbir Zoo. Despite sincere efforts and strict guidelines of the zoo authorities, people keep throwing waste material, including plastic bags and water bottles, on the zoo premises. Even the lion safari, spread across more than 2 km and a dedicated place for one Asiatic lion and three lionesses, is not spared. 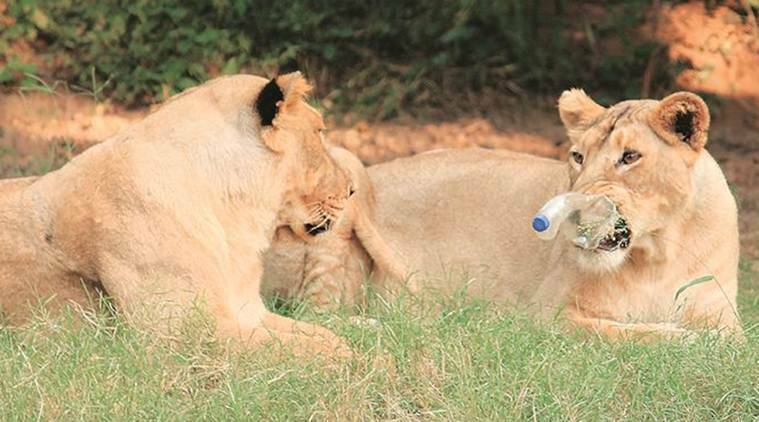 One of the lionesses, Heer, who has been let loose in the open safari along with another lioness, Halley, and lion, Yuvraj, was spotted chewing a plastic bottle inside the safari on October 15. Senior zoo officials admit that littering of waste material is a problem in the zoo and people deliberately throw stuff like plastic bottles and bags to attract the attention of captive animals. In the lion safari, there are currently three lionesses — Shilpa, Halley and Heer — and one lion, Yuvraj. Currently, Shilpa is kept in an enclosure set up inside the safari, and two other lionesses roam free along with the only male in the safari. According to the zoo schedule, the enclosures of animals, including the lion safari, are cleaned every Monday, when visitors are not allowed to visit the zoo. A watchman appointed in the zoo for looking after the animals told Chandigarh Newsline, “Lion safari is not accessible to everyone. A visitor can enter the safari only in the safari bus. We appeal to visitors not to throw waste material in the safari. We catch more than two dozen people every day for littering on the zoo premises. It can be a game for the visitors to attract the attention of animals by throwing waste material in their enclosures but this trend is a threat for animal.” A senior zoo official says waste material poses a serious threat to animals who prefer to eat everything out of curiosity.